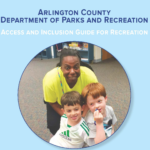 Arlington County Department of Parks and Recreation is committed to the American’s with Disabilities Act which guarantees non-discrimination and equal access for individuals with disabilities in all programs, services, and activities. We will provide modifications upon request. Advanced notice for modifications is welcome. (Done for all participants identified through the TR office) – Develop a modification plan that will be shared with staff that outlines your participants support needs. We can work with staff to ensure that these supports are being facilitated effectively. (Lowered Ratio) — Tier I supports and provide an extra staff to support the whole group by lowering participant to staff the ratios. (1:1) – Tier 1 supports and provide an additional staff to work specifically one on one with you or your participant. The level of support we provide is based on: participant need, program structure/dynamic, and availability of staff resources. Supports can be offered in many ways such as staff trainings on tier one supports and the PMP, as well as in -the-moment consultations and recommendations for modifications any staff can facilitate. We do our best to ensure an additional staff is available as needed, but we cannot guarantee a staff. Complete online, phone-in or mail-in registration. When prompted, identify that inclusion support is needed due to a disability. Download and complete a Participant Modification Information (PMI) form. Submit completed forms. Forms can be submitted via email to trinfo@arlingonva.us or mailed/dropped off to 2121 N Culpeper St. Arlington VA, 22207. Please make sure to identify which programs you are requesting support.